Alpha-linolenic acid (ALA) is an omega 3 fatty acid found primarily in plant sources, notably flax and walnuts. It is a precursor to the essential fatty acids eicosapentanoic acid (EPA) and docosahexaneoic acid (DHA). Evidence suggests that ALA intake reduces coronary heart disease and related incident risk, and has been associated with anti-inflammatory, neuroprotective, and anti-cancer effects. Recommended intake to benefit from this protective effect is 1.1 to 2.2 grams per day. There has been some evidence, however, suggesting that supplementation with 2 grams of ALA can increase levels of prostate specific antigen, which may be of concern for individuals at high risk of prostate cancer. 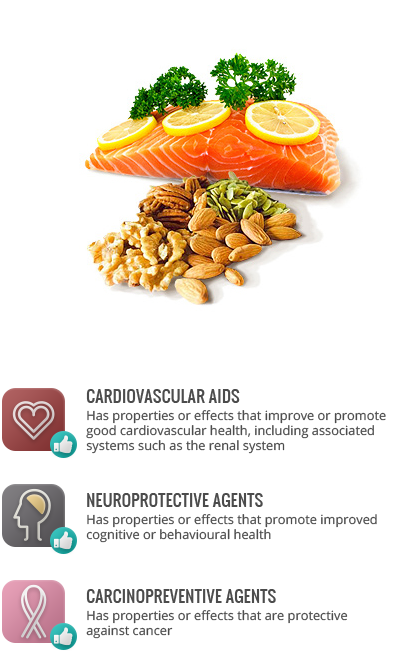 See: Omega-3 fatty acids. Some studies find that ALA does not confer the same cardioprotective benefits as EPA and DHA. Fatty acids are not consumed in isolation, studies of consumption of various oils or fat sources may provide differing evidence of health benefits and risks.